Nominations closed on 4 April 2019 with 28 candidates standing for the 17 seats above. You can see the full list of candidates here. Candidates in the Public (Rest of England and Wales) group and the Staff (Other Clinical) group have been elected unopposed. The other five groups will go to election. 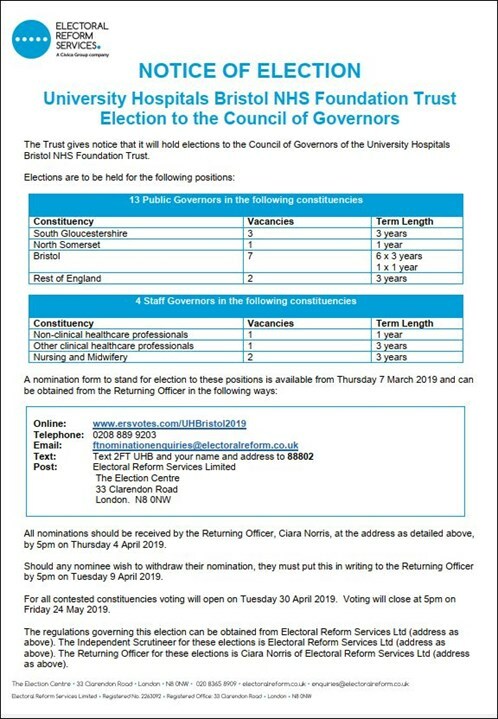 Members of staff and Foundation Trust members will be able to vote for their preferred candidates between 30 April-24 May. To find out more please contact the UH Bristol Membership Team on 0117 342 3764 or FoundationTrust@UHBristol.nhs.uk. 2018 Staff Governor Election Results: The 2018 Staff Governor Election (Medical and Dental) concluded on 31 May 2018. May 2017 governor elections: Nominations ran from 7 March 2017 - 4 April 2017. Following the close of nominations one candidate was elected unopposed. Voting took place from 28 April to 24 May 2017. The notice of poll, including the names of those who were standing in each constituency is here, the statements of the candidates standing for election are here, and the results are here. May 2016 governor elections: The results of the 2016 elections (15 seats up for election) are available here (contested report) or you can also view the uncontested report to see the candidates who were elected unopposed. Statements from the candidates are available here. June 2016: There were two extra governor seats up for election in June 2016 - Staff Governor (Nursing & Midwifery) and Patient Governor (Carers of Patients under 16 years). The staff governor was elected unopposed, you can see the result here.